Sold by Viesyled and Fulfilled by Amazon. Gift-wrap available. Save an extra $1.00 when you apply this coupon. $1.00 extra savings coupon applied at checkout. 【set of 2 bulbs 36 pieces 5W high power LEDs per bulb. 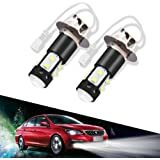 Total High Power 50W and Much 300% Brighter than Regular 15W H11 Fog Lights. 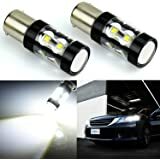 (not for headlights )Buy with confidence, We offer "ONE YEAR" warranty on item(s) that confirm to be manufacturer defect. 【Cross Reference Number】 H11; Color: 6000K-6500K Xenon Yellow. Size: 1.5" long and 0.75" in diameter(LED part).Max Capacity: 50W; Operate at 10W. 【Easy installation】 Non-polarity design. Just plug & play and no need ballast to replace your bulbs directly. Plug and play for most vehicle. Long life span and waterproof design. 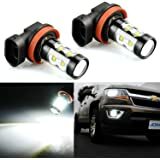 【Application】Used for Daytime Running Light, Fog Light ONLY. 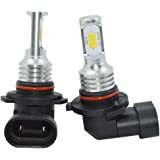 (These bulbs are not headlights, no high/low beam function). 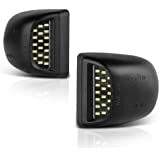 Application: Perfect replacement for Fog/Driving Light, Daytime Running Light, etc. 【Note】 A load resistor kit might be necessary for vehicles equipped with CANBUS system to bypass the error codes. 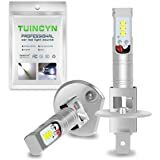 Specifications Base Type: 880 Operating Voltage: 10~30 VDC LED Type: 3014 LED Quantity: 78 LEDS Total Power Consumption: 3.2 Watts Type: Replacement Bulb Beam Angle: 360 degree Replaces Stock Bulb: 889, 892, 893, PG13, PGJ13, 880, 890, 862, 884, 885, 894, 898, 899 Package Dimensions: 2.4" x 0.9" x 0.9" Introduction: Led technoloty, amazing super bright lighting High power can reach 50W No delay to light upLow Power Consumption and high lighting Faster on/off response time Energy saving, environmental protection, Stable performance, through strict test, Use safer driving in the car. 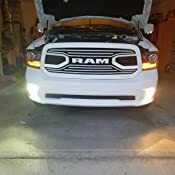 5.0 out of 5 starsExcellent upgrade for Fogs on a 2018 Ram Sport! Great upgrade on my 2018 Ram Sport Reg. 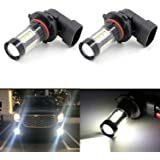 cab fog lights! Install was super simple, P-N-P and the light output is much higher than OEM...plus they have a nice whiter-hue than the yellow-ish OEM's! these 9006 bulbs appear to have great quality for the price; will update if anything changes. One pic is of stock (drivers) and LED (passenger) and the other is both LED's installed. 2.0 out of 5 starsEasy to install not that bright. Installed on my 2011 Toyota rav4. The stock bulbs were very dim so I got these as a replacement. 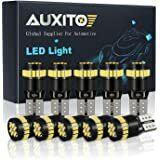 Easy to install just remove the old bulbs plug these in and install them. That's why I gave them at least 2 stars for ease of replacement. As far as bulb brightness they were dangerously bad, the light was reflected more up in the air at the trees and side of the road due to the fact that the OEM light assy had a reflector inside of it in front of the bulb face where the magnifier lense is , but even when I removed the small reflector they were still terrible only to shine approximately 15 to 20 feet in front of the car. I was using my high beams constantly to see where I was driving. 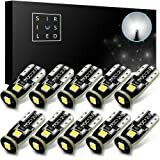 I ended up buying regular stock bulbs as a replacement to these LED bulbs. 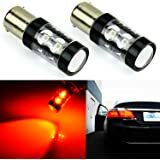 I would only recommend using these as a fog light only or if you have a headlight style with no light reflector in front of the bulb face. 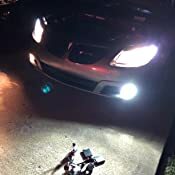 Earlier i changed my headlights low beam to LED white lights but my fog lights were yellow which was not looking good. Ordered these and fixed it when i was working on my bumper so it was easy to install when the bumper was off. Not sure if there is a way without removing the bumper. But the light looks awesome and the brightness is surely making a difference. 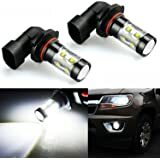 I bought a set for my 2008 4Runner fog lights. It was pretty simple to replace them. 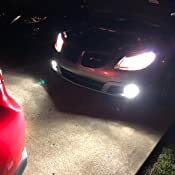 The stock bulb had a yellow tint as designed for fog lights whereas these LED bulbs are very white matching my HID headlights. The construction of the bulbs are pretty basic without any active cooling fan and only time will tell how long it will last. However, judging by my interaction with the seller, I believe they will stand behind their products so if there is any issue, I will contact them and update the review. 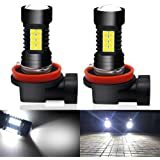 5.0 out of 5 starsGreat lights; AWESOME support! 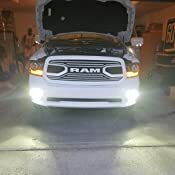 The lights worked great, and although on my particular install I had a small issue, the customer support that I received from Viesyled was fantastic! They mailed me an additional item to help out with my install at no cost, and it fixed it! A great product backed by AWESOME customer support! Seriously, if you have any questions or issues during install these people will go the extra mile to make certain that everything works perfectly.